MESTIZA New York is just what the Brand Assembly Square has been missing. Placing their emphasis on creating contemporary cocktail pieces, the brand's co-founders Louisa Rechter and Alessandra Perez-Rubio have brought a fresh approach to design with their unique insight and genuine excitement around this particular category. We'll be the first to admit that as each work day comes to a close, it's hard not to walk by their nook and swoon over the lavish (but still wearable) collection of gowns, jumpsuits and party dresses. With considerable care and quality, the duo behind MESTIZA have been able to position the brand as a leading authority when it comes to all things eveningwear. We wanted to learn more about what led them to focus on this aspect of fashion and are thrilled to share our conversation below. Discover Louisa and Alessandra's stories, their favorite places to spend time during an off-duty evening, and an exclusive second part of this feature on The Style Line. Louisa: I am the co-founder and CEO of MESTIZA NEW YORK. Originally a buyer and merchant at Milly and Coach, Alessandra and I launched this line in March of 2015 as huge labor of love and an opportunity to fill a white space in the market. When I’m not working on MESTIZA, I love hanging out with my fiancé, decorating my apartment with items that inspire me, painting, cooking, having drinks with friends and planning my wedding… we are designing my dress, bridesmaids dresses and the mother-of-the bride dress! Alessandra: I am the co-founder and creative director of MESTIZA NEW YORK. I call MESTIZA my second baby because while Louisa and I were working hard to get the line off the ground, I was pregnant with my first baby. What’s funny is that I went into labor and gave birth to Carlos on the very same day we launched our online store! It has been a juggling act, balancing being a mother and an entrepreneur, and I am lucky to have a business partner who has been so supportive throughout this journey! We hear a lot about “day to night” dressing, but let’s focus on the “night/evening” aspect of style. Do you think this approach to design differs from traditional RTW? What about cocktail attire resonates with you the most? Alessandra: Designing the perfect garment is an art form whether it’s casual basics or couture eveningwear. We decided to hone in on formal-wear because it excites us the most and we felt there is an absence of unique cocktail attire in the market. When designing, I like to focus on how each and every piece needs to be special and stand out. When browsing the MESTIZA site you will never find anything basic or practical. I’ll go even further and say that practicality is not in our brand DNA! We don’t want people to come to us because we are the safe choice, we want people to come to MESTIZA because they want something original that sparks a conversation. Based on your experience, how do you think the contemporary fashion community/market fosters those focusing specifically on eveningwear? Louisa: We think there is an absence of unique cocktail dresses and gowns in the market. One of our intentions of launching MESTIZA NEW YORK was to fill this void. When Alessandra was planning her black tie wedding a few years ago, I scoured the Internet for the perfect formal dress. The options were either out-of-budget couture brands or they were replicas of stereotypical red carpet gowns (that didn’t look flattering). We want our line to provide women with tasteful options that bring out their personality. What role has being a member of the Brand Assembly Square contributed to your approach to design? Alessandra: Brand Assembly is a collaborative environment. We learn something new every day by the other industry people around us. Sometimes we learn about new fabric vendors or other times we get the contact information of an insurance broker. Regardless, the knowledge the other members impart on us helps us become better and more efficient designers and businesswomen. Speaking more to the previous question how would you characterize the Flatiron neighborhood and are there any venues or places around this area that are your go-to’s for an evening out? Louisa: Flatiron is an ideal location for emerging designers, it’s so close to our vendors in the Garment District but also near some delicious restaurants… we love ABC Cocina and Cosme. We are also excited for a new plant-based burger joint to open up below our office! We will definitely go there for lunch! What typically comes first, business or design and how do you know when to prioritize between the two? Alessandra: They’re equally important and you can’t have one without the other. Luckily, we have divided up the work so that Louisa spearheads the business aspect and I handle the creative. We both flex in our positions but on a daily basis, all angles are covered at all times. Alessandra: We try to bring designs of the past to life in a way that fits in with our New York lifestyle. We modernized the Terno which is a traditional form of dress in the Philippines. Criticized as being something your grandmother would wear, we crafted it in a sleek, tailored silhouette in a modern fabrication with unique embellishments. It looked fresh and cool with a nod to our heritage. Our new trumpet gown also has sleeves that are inspired by the Maria Clara, another traditional form of dress in the Philippines that we re-imagined. Louisa + Alessandra: We are always finding new ways to expand the assortment in meaningful ways. 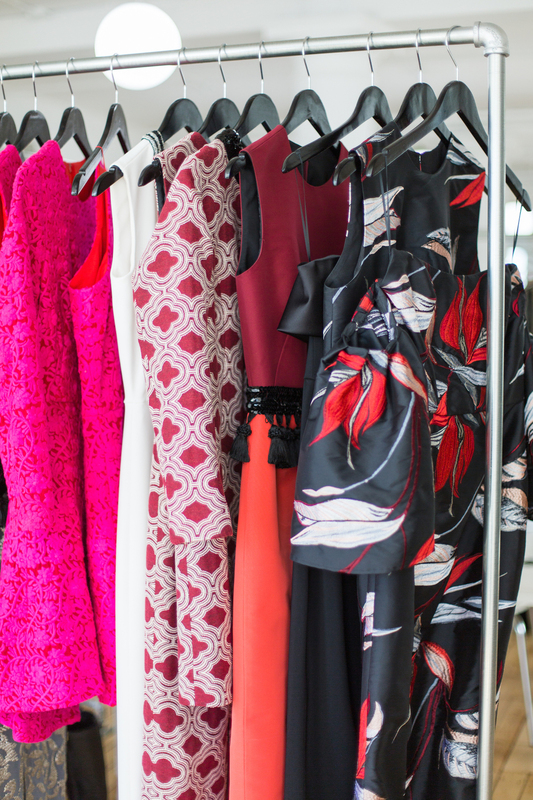 Last season, we focused solely on dresses. After receiving feedback that women would like to see embellished tops, we added them for fall 2016, along with a printed cocktail coat.